Under the direction of the new Director General of the World Health Organisation (WHO), Dr. Tedros, this year’s World Health Assembly was grounded in the ambition of achieving universal health coverage (UHC). Indeed at least 80% of side events I attended weaved the catchphrase in to their titles and the STOPAIDS event co-organised with the International HIV/AIDS Alliance, RESULTS UK, MSF, AidsFonds and International Civil Society Support (ICSS) was no different. Our event sought to create a space for stakeholders (including donors) to discuss 1) progress and challenges to towards sustainable domestic financing for health, 2) the connections between donor policies on sustainability and transitions and country experiences and 3) a shared understanding of the roles of the development community in supporting countries in transition. Our speakers represented the Global Fund, the UK Department for International Development (DFID), The Global Drug Facility (GDF), WHO and International Civil Society Support (ICSS). Danny Graymore, Head of the Global Funds Department at DFID, spoke first sharing his insights on the Global Polio Eradication Initiative (GPEI) and its impending wind down which will leave the WHO’s budget dramatically reduced and many countries’ health infrastructure significantly weakened. While donors, including DFID, are suggesting that funding previously supporting polio eradication can now be withdrawn and directed elsewhere, GPEI funding is serving a critical role in providing wider immunization programmes. In four countries, GPEI funding accounts for over 50% of total WHO staffing costs and in some countries 70% of global funding for surveillance (including identifying new cases and detecting importations of diseases) comes from GPEI. Civil society predict that the closure of GPEI will lead to total collapse of immunisation programmes in some countries and are calling for donors to develop plans for transition that ensure immunisation coverage continues once polio is eradicated. Danny shared that the UK isn’t looking to reduce the proportion of the aid budget that is spent on health, which is positive news. DFID are however looking to generate analysis to show that UK ODA is going to the best possible use. Part of demonstrating this should include an analysis of whether the development outcomes achieved with DFID funding are sustained and built upon even after DFID exits. Unfortunately, DFID’s newly released value for money guidance has no references to this. 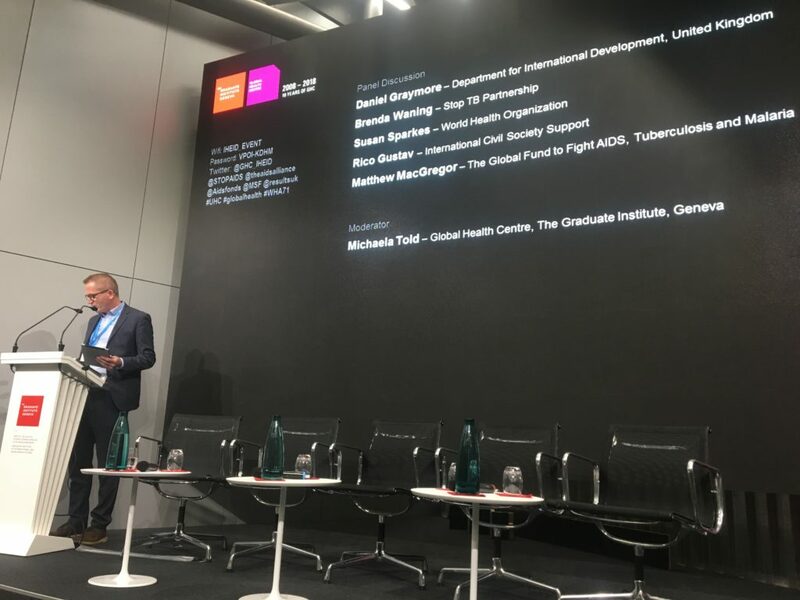 Danny Graymore, Head of DFID Global Funds Department speaking at Transitioning in the context of UHC event organised by STOPAIDS and partners at WHA. Matt MacGregor, Senior Project Lead, Sustainability, Transition, and Co-Financing at the Global Fund, followed Danny and in his presentation recognised the strain that transitions put on key populations and civil society. He also signalled that the Global Fund is committed to improving its approach to sustainability, transition and co-financing when he said that the policy the Global Fund have is a step in the right direction, but just the beginning of this work. 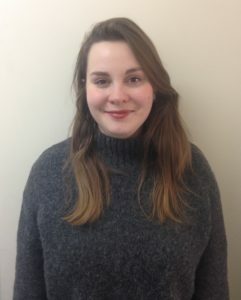 Having recently updated its eligibility policy only last month it’s clear that the Global Fund are aware of the importance of getting the right investments to the right people but that this will require a sustained effort to embed the principles of their policy in the work of the Global Fund. Following the donor presentations we heard from Brenda Wanning, Chief of the Global Drug Facility. Brenda outlined how donor funding has created an artificial environment for procuring quality affordable drugs, using mechanisms like pooled procurement. This has then created challenges when countries transition and return to suboptimal national procurement systems. Her presentation was solutions orientated and she suggested convening a group of actors to address the issues countries face in drug procurement during transition. This group would work to create a checklist countries could use to assess readiness to return to domestic procurement. With the high level meeting on tuberculosis coming up later this year in September we have a global opportunity to ensure these challenges are discussed and steps are put in place to address them. Susan Sparks, Health Financing Technical officer, Department of Health Systems Governance and Financing brought the discussion back to UHC and reminded the audience that the UHC umbrella means that health care isn’t just about specific disease programmes being available but treating people holistically and recognising their multiple and overlapping health needs. She also flipped the narrative from talking about the importance of donors’ approach to transition to the importance of countries’ experiences of transition and suggested that country experiences should be at the centre of the transition conversation. Finally, we heard from Rico Gustav, Senior Policy Advisor, Sustainability at ICSS. He started his presentation by saying that we need to stop talking about transition as if it is a natural inevitable phenomenon – it is a choice based on an ideology that only the poorest countries are deserving of aid. He also reminded the audience that often the decision to transition is based on the dangerous assumption that governments will automatically pick up where donors have left off. Country experiences have proven this assumption to be untrue. He pushed donors to acknowledge that transitions aren’t just about financing but also about ensuring that the political will exists to maintain health care services, and especially to support the most marginalised when donor funding is no longer targeting key populations. He finished his presentation critiquing the UHC agenda, saying that the obsession with coverage is and will lead to a quality, quantity dichotomy. Rico’s critique relates back to Brenda’s point about drug procurement, when countries switch from pooled to national supply chains they may still be accessing drugs but the medicines reaching those who need them are likely to be of a much lower quality. This quality vs. quantity could also have much wider implications not just for access to medicines but access to health care which, as Susan said, should be holistic and must be based on patient need above all other things. STOPAIDS work on DFID’s approach to sustainability and transitions continues and we co-convene a working group with RESULTS UK on the subject, if you’d like to join please get in touch with jenny@stopaids.org.uk.